I saw an unusual car a few days back. Before i tell you about that (and show you it's snaps), i want to tell you about a car we bought when i was a kid - a second-hand fiat car. We were quite excited. Except me. I thought it was cool for me to tell my friends that we didn't have a car. Logic: Everyone has a car. So it's obviously cool to not to have one. - Older Male (= Dad) suggested white. - Older Female (= Mom) said 'not white because difficult to maintain but any other light colour preferably in shades of light blue'. - Younger Female (= Sister) went for light pink or something which brought frowns from dad/mom and peals of laughter from me (after which sister and i fought - but that's a separate story). - Younger Male (=me) was very clear about black . i pictured myself in black shades, driving a black car in black clothes speeding down the black tar of 2nd cross lane (how in Bombay and how in a fiat don't ask). Now remember we told the guy we wanted the same colour 'with some variation'. Now variation can mean a lot of things to a lot of people. I know people who think black is a variation of grey. (it is? Oh...ok...whatever...) . Basically we trusted the guy to have the same level of taste as us - work a little creatively but stick to something similar to the above. 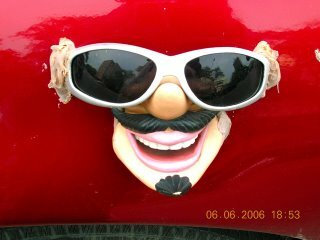 After a couple of weeks, Rathod gives my dad a call - 'sir, your car has a first coat on it - do you wanna have a look'. Now, for various reasons i will not get into, basically we didn't take a look. One reason was that trust thing again: "How wrong can a brown get? No Rathod, you just go ahead - what do you feel?". And Rathod said:"First class, sir. Your car is just gleaming. Couldn't get better". Yea. We were as shocked as you are, dear reader. I didn't have to face the initial agony - i was at home wathing Maharashtra thrash Bihar in a Kabbadi match telecast live on DD-1. "Ok. What are the chances that i drive this into Mohammed Ali road* and come out alive" or "Will my wife continue to cook for me? or will i die of starvation?". *(Mohd. Ali road is a famous road in Bombay, primarily populated with Muslims and Orange/Vermillion is a colour associated with Hinduism and those were particularly communally charged times). When i saw the car, i had other questions: "What are the chances that i will make another friend in this lifetime?" Mom was furious. Sister almost had a tear in her eye. Dad's explanations made us even more mad eg. "Now no one will steal the car", "It's easy to find in a parking lot". Grandmom, quick to come to dad's defence, said "All that matters is that the engine runs well". Rathod who believed that vermillion was a 'shade' of brown said : "What a colour, sir! Amazing! I'm recommending this to whoever asks for suggestions". My dad didn't bother reacting. At the end of the day we just had to live with it - and we did so for 8 years! I had a very simple strategy to deal with this - sit in the backseat always. If you are driving only with dad - in which case you had to sit in the front seat - you had to be extra alert. "God! - there's Sandeep - can't allow him to see me in this car - DIVE!"... and then just pretend i dropped something and take cover. Used to happen so regularly that 80% of the time i was sitting on the floor of the car. - We once got chased by Muslims doing namaz on a street who thought we got this car there on purpose. 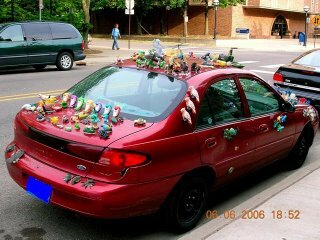 - Once we went by this car to attend a religious discourse . When we approached the gate, we heard trumpets blowing, drums beating, flowers being showered - the organizers very logically thought that if a Hindu religious speaker had to come in anything, it had to be a vermillion car. All they got was four shocked passengers getting out of the car. The chap blowing the trumpet looked visibly annoyed. He had reserved his breath-expelling gusto for the personage to come and it just got wasted on some commoners. - Once my dad, who is prone to practising music lessons in any vehicle (especially a car he's driving), accidentally broke a signal. He half-looked up at the cop with a guilty expression. The cop saluted him! - orange is the also colour used by a political party in Bombay - evidentally pandu thought my dad was some political bigwig. The orange car left deep psychological scars in me. i never order orange juice anymore. I see orange in my nightmares. When i develop high fever and get into a delirium i can be heard mumbling 'orange....vermillion...orange...', I have come to hate orangutans etc. etc. Never. Even if the person who owns it is my best friend. No. Not a chance. 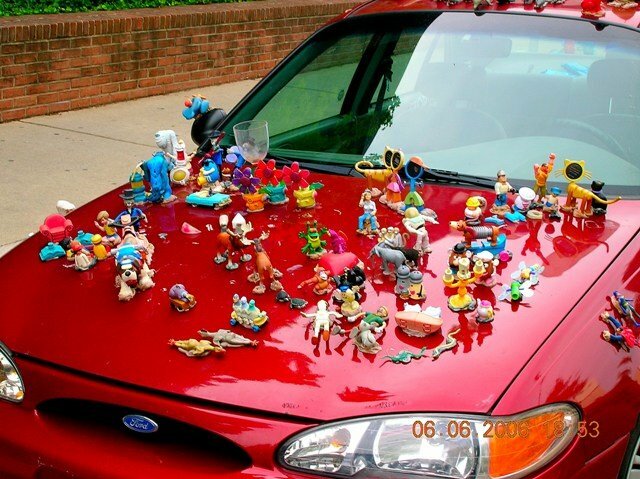 I know it's creative but, but...it just looks like someone vomitted a whole lot of toys on the car! Yikes! i would always think of that if i sat in the car. Check the wine glass on the front hood in the snap below. What does it tell you? Yep - Do not drink and drive. Very creative. But still will not sit in. And the last snap (this is on one of the doors) - cute mask i agree - but what is it stuck with? (see the sides)...Is it....? No! I'd anyday prefer my orange car to this anyday. While i have recovered from the scars left over from the orange car, i would never be able to recover if i travelled by this car. If you own this car, drop me a line and send me your snap. I'll know whom to avoid. your exams are over, i guess. Also remember seeing u 'dive' once! That's you, Sharat, i'm sure! You had travelled by the vermillion one too, right? Wonder how you felt? of course, not being from Bombay wouldn't have affected your popularity in any way. you are like wine, getting better every day and every hour. I love your writings man, they seriously make you smile. I thank the day i stumbled across your blog. About the proversbs being a coincidence, i dont think so. vintage is a very dear friend and now, so are you, so i guess two friends saying the same thing could be much more than mere coincidence. Take care, bud! Pink???????? Grrrrrrrrrr..... Did I ever say pink or are you making this up??????? i said 'light pink':). No? most of all, being pure and simple and good at heart. Ah, thats a talent thats really dying out these days. Sharan, stop advertising yourself! We know you are great (some rub-on effect of being with people like me, I guess) but don't use our views to boost your ego publicly! Thanks as always for the (undeserved) compliments! Yes, i am Sharan's sister. You haven't seen Sharan boring people with philosophy and statistics! Thank God he's kept out of that! All this is OK!But what about the much awaited remarks/impressions from 'RATHOD,THE RASCAL'!!! We recalled all our association and the trips in that 'vermillion'.We laughed our guts out.But enjoyed thoroughly. Yes! missed out on Rathod the Rascal - wanted to put some more about him - but then thought it'll get too long.